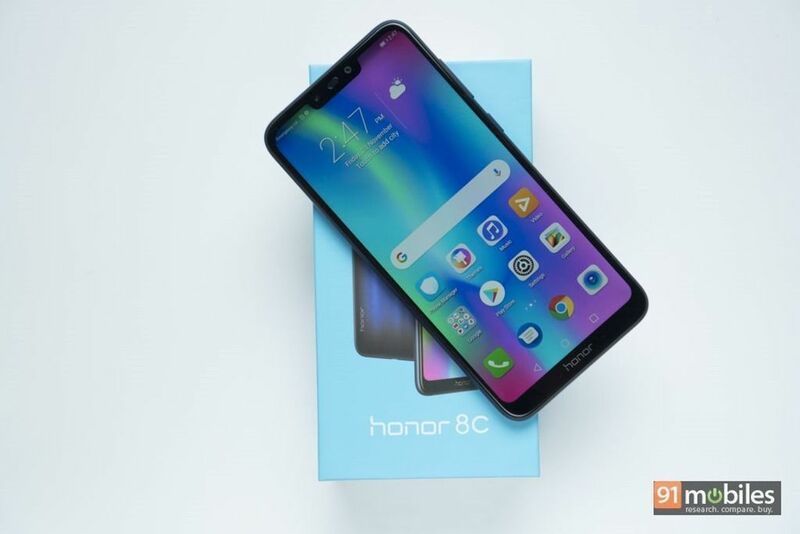 While Xiaomi seems to be quite active in India’s smartphone market in terms of the number of launches, another brand which continues to unveil handsets in the country at an unprecedented pace is Honor. 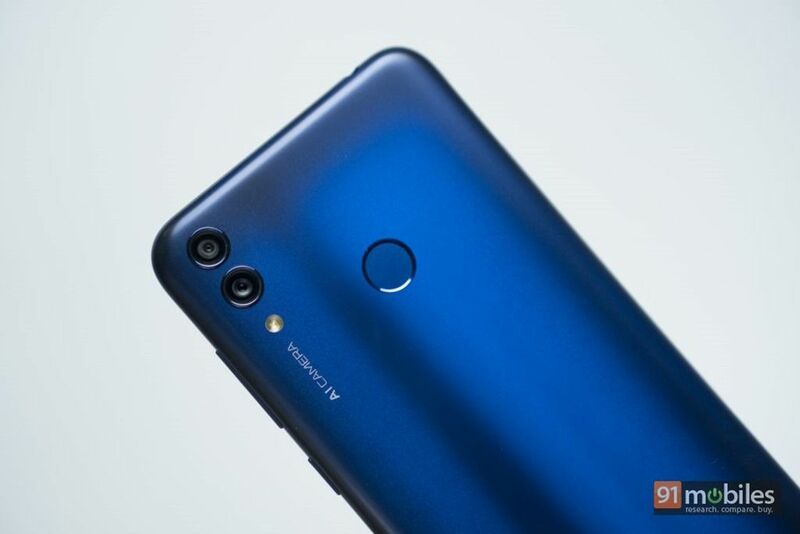 Just last month, the company introduced the Honor 8X (first impressions) in the subcontinent, and now it’ll be bringing an affordable variant in the form of the Honor 8C. The device will be launching in India on November 29th, and before that, we have managed to get our hands on a retail box. 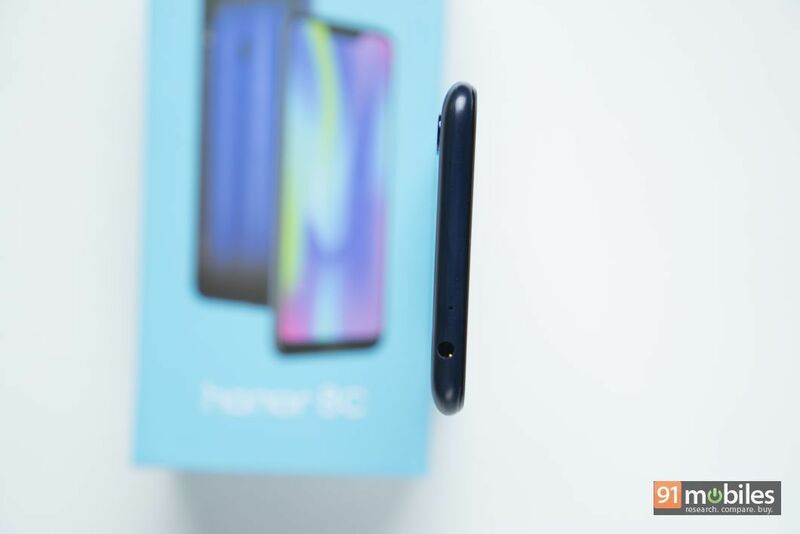 So without wasting any more time, let’s take a quick look at the Honor 8C unboxing, followed by our initial impressions. 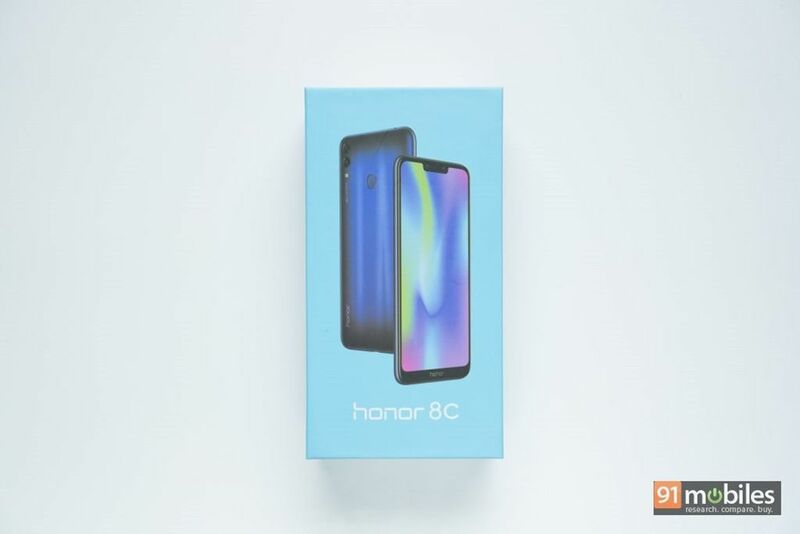 Similar to retail packs of previous Honor smartphones, the 8C comes packed in a colourful box with the phone’s picture up top. At the back, you’ll find the key specs. You’ll be greeted by the handset upon opening the box. Beneath that, an envelope houses a couple of documentation along with a silicon cover and a scratch guard – both of which are thoughtful additions. Below that, you get a micro-USB cable and a 2A wall adapter. There are no earphones, though that’s not really unusual in case of budget smartphones. 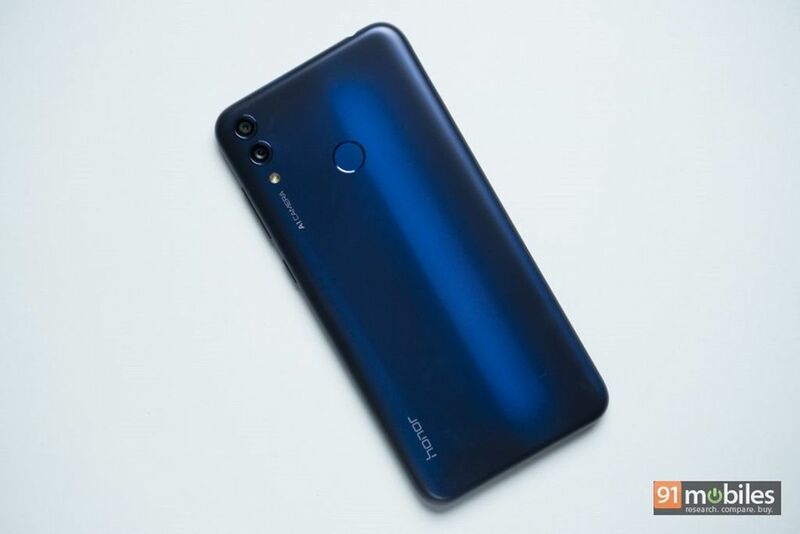 Coming back to the device itself – even though the 8C is supposed to be a toned-down variant of the 8X, the latest handset does pack in a new design. Instead of a glass back, the handset has been constructed out of a single slab of metal. And yet, it has a sheen on the rear panel. Our unit features a blue hue which bounces off the light (not as much as a glass surface though), making it quite attractive in its own way. In terms of elements, you’ll find vertically-aligned dual cameras with an LED flash below and a fingerprint sensor. While the 8X features a sizeable 6.5-inch display, a 6.26-inch screen graces the fascia of the Honor 8C. 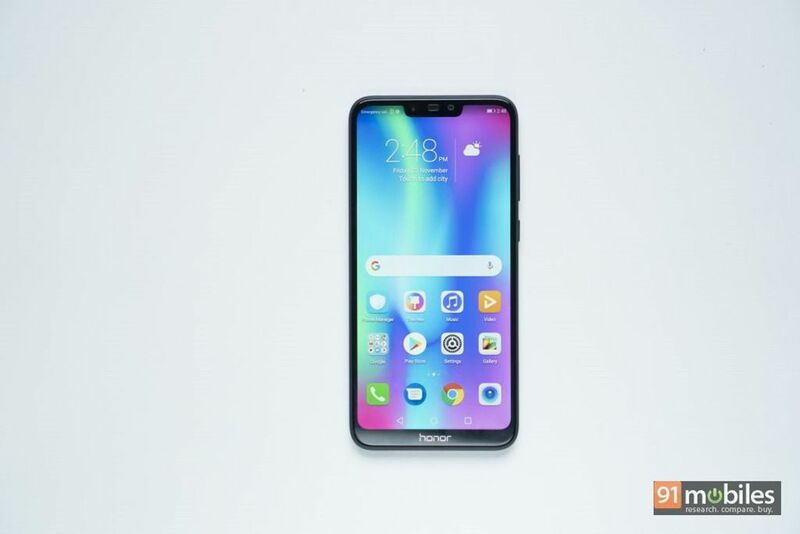 You do get a notch up top, which is home to an earpiece, LED notification light, a selfie snapper and a couple of sensors. Similar to its sibling, the handset features a 19:9 screen aspect ratio, though it scales down the resolution to 720 x 1,520 pixels. And the effect of that choice is visible – the IPS panel isn’t as sharp. The display does seem to get sufficiently bright however, and viewing angles are also good. There’s also a considerable amount of chin at the bottom, which has the Honor branding. 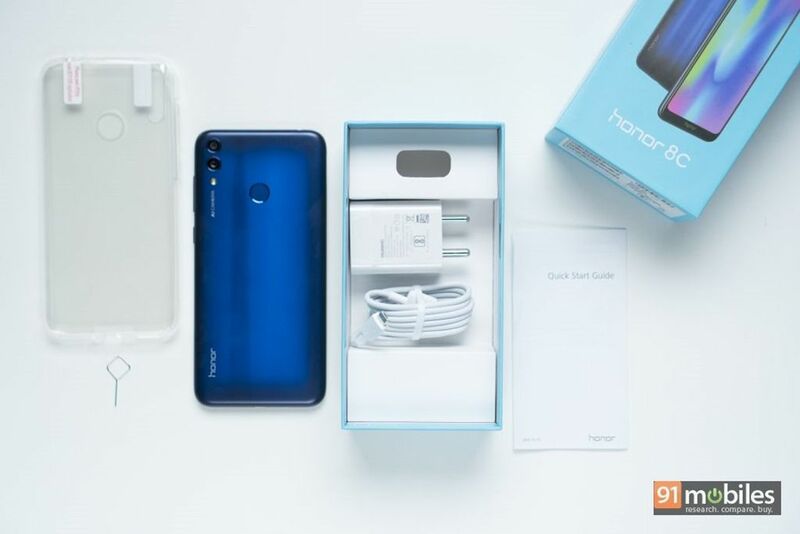 You’ll find the usual ports and controls on the Honor 8C. Among the first things that I noticed as soon as I picked up the handset is the fact that it feels really lightweight, even though it tips the scale at 167g. The phone’s waist measures 7.9mm, but thanks to the dual-curved rear, the device seems quite sleek. This surely ups the ergonomic quotient of the 8C. 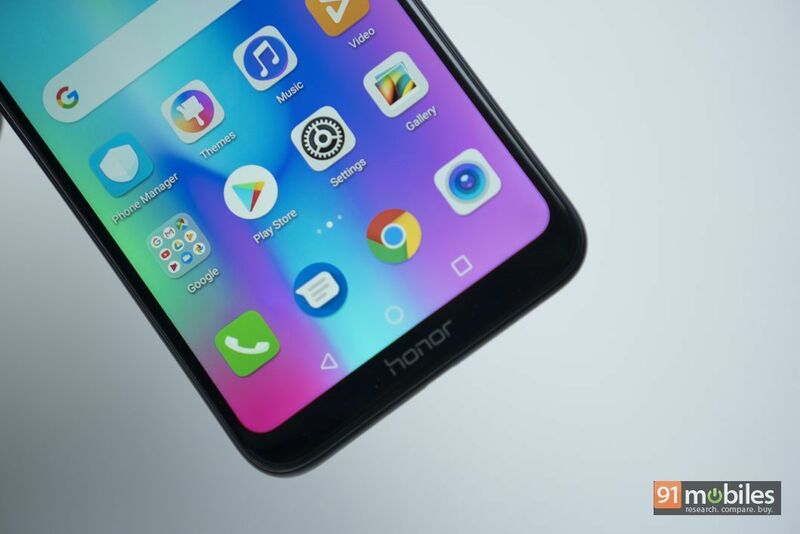 While Honor usually opts for its homegrown Kirin chipsets for its handsets, the 8C is the world’s first smartphone to draw power from Qualcomm’s Snapdragon 632 SoC. The octa-core chip was announced during MWC Shanghai and comes with two quad-core Kryo 250 clusters clocked at 1.8GHz. The silicon is paired with 4 gigs of RAM. During my brief usage, the hardware was able to offer smooth navigation and jumping between apps was swift too. Of course, its actual prowess can only be known while running heavy apps and games, so stay tuned for review to know about that. 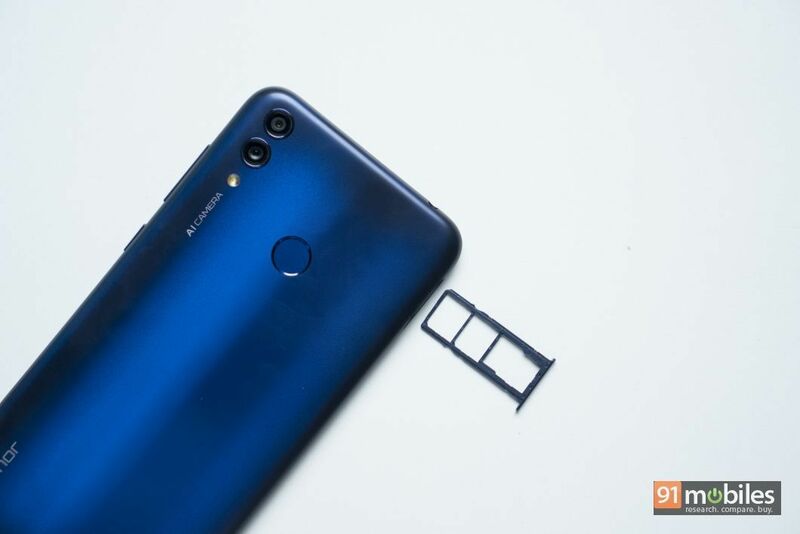 Our unit of the Honor 8C ships with 64GB storage onboard (there’s a 32GB variant as well), out of which around 52.5GB space is available to the end user. You can also expand it further with the use of a microSD card. With regards to imaging, the Honor 8C offers a pair of 12-megapixel f/1.8 and 2-megapixel f/2.4 snappers on the rear. As you can expect, the combination offers a portrait mode, and the handset also gets AI capabilities from its siblings. Once turned on, the feature can automatically detect the scene you’re trying to capture to offer the best output. During our initial testing, the mode works like advertised though we’d need to spend more time to see if it makes a meaningful difference. 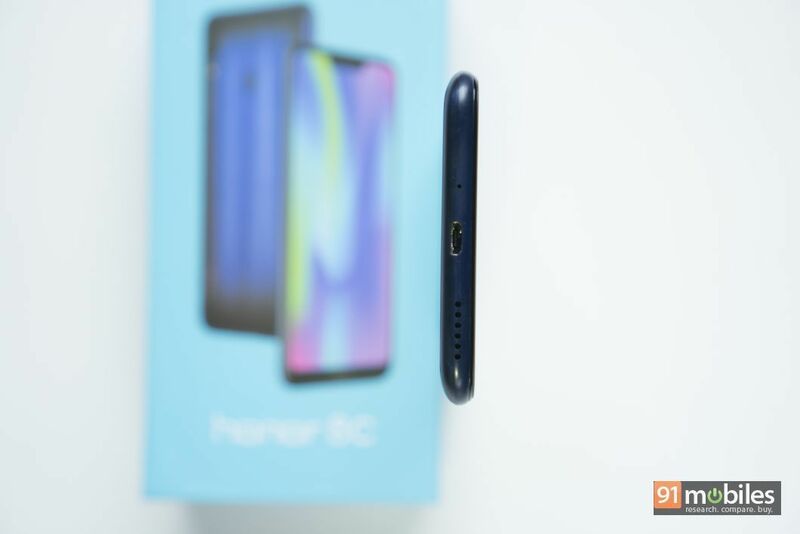 While the 8C seems to be watered-down variant of the Honor 8X, in the battery department, it gets a leg up. That’s because the smartphone packs in a 4,000mAh cell, which, combined with the 720p display, should ensure that the charger isn’t required in the middle of the day. 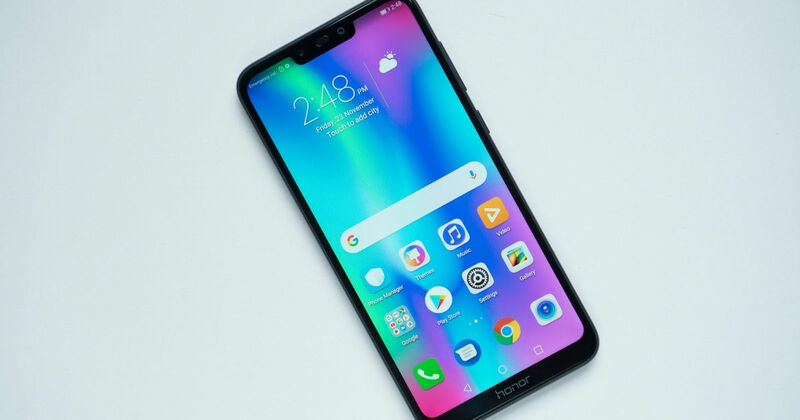 It’s clear that Honor wants to match Xiaomi toe-to-toe. 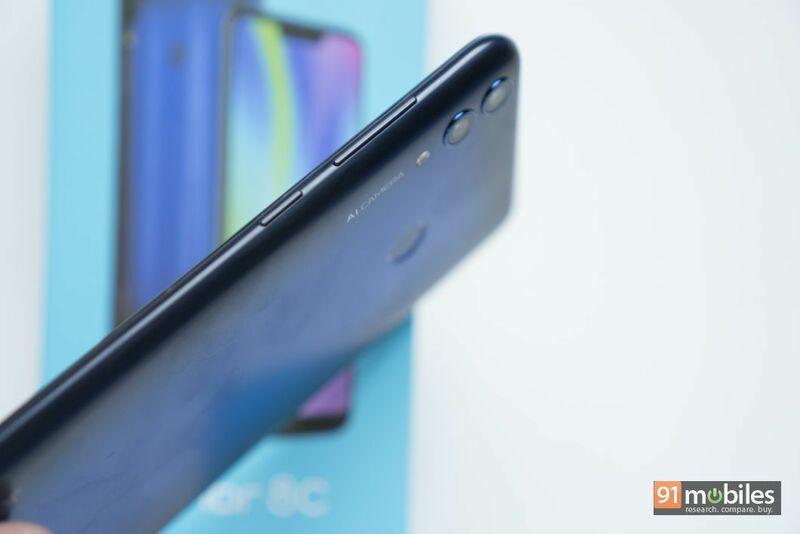 While the 8X might be able to fend off the challenge from the newly-launched Redmi Note 6 Pro (review) in the Rs 15k segment, the 8C can be expected to compete against the Redmi 6 Pro (review). 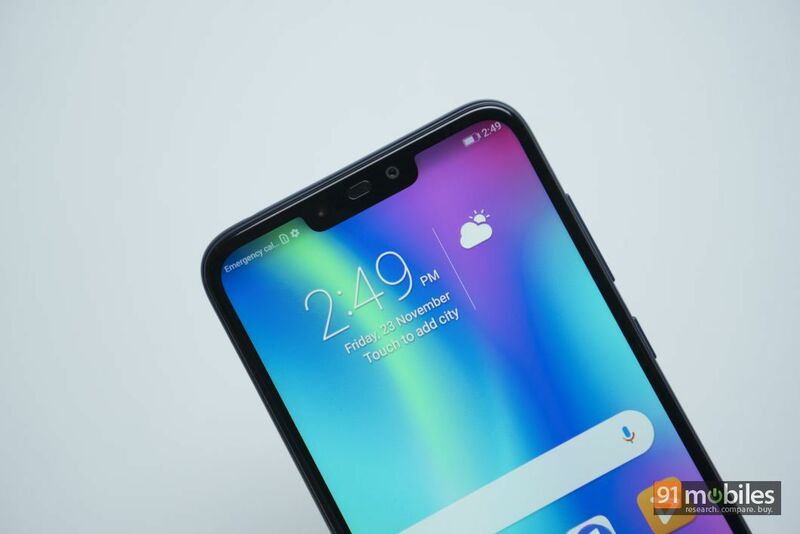 In China, the smartphone’s starting price is set at RMB 1,099 (~Rs 11,000), which makes it a budget offering worth watching out for, though the choice of an HD display might put it at a disadvantage.